Cable Pulling machines are one of the premium quality equipment’s. It is not only reliable and efficient for the purpose and it provide the best cost effective method of laying about all cables to come in the upcoming years. These cables are durable as well as long lasting in nature, and it is safe for usage. Some of these cables are made out as per you requirements and is being customized accordingly. 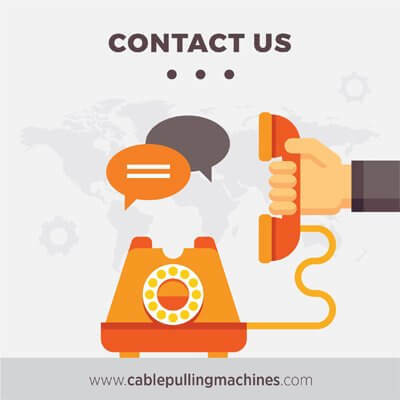 The essential part of cable pulling machines are the cable drums as it helps all the units to accommodate all tasks together which are heavy and non movable by one self. They help to carry out the works as it got the best quality hard copper cables, which are very hard to move from one part to another. These cable pulling machines are generally used in various projects both onsite and offsite. The cable-pulling machine consists a power unit with diesel engine rated from 13Kw to 3600rpm. It also consists of a main drive system with a single capstan. hydraulic driven rope tension with rewind drums drive. It also contains dial gauge for pressure pull with a pull load indicator. The diameter of the rewind drum states from 400mtrs x 10mm with maximum capacity. The rope laying is a free moving laying arm, which is mounted under the rewind drum. The manufacturer makes sure that the cable pulling machines are capable of carrying out various sizes of drums with the help of cable wire. It comprises of a vast number of hydraulic and cable machines that helps out in smooth work flow and takes care about the performance as well. The equipment’s are all the upgraded versions with the latest technology and it is definitely focused on the best materials. You should gather up your knowledge before you end up purchasing any Cable pulling machines. Get to know about the manufacturer, see their selling details and also the reliability. Check the safety and the quality of the product. The warranty period is valued for long good 2years. Also go through the maintenance options and the services the company provides with the availability of cheap parts.